Blanchou cottage is an old stone farmhouse with all modern conveniences including air conditioning in each room. It is set in grounds of ten acres with magnificent views a very tranquil location but only 10 minutes away from Clairac on the river Lot and Aiguillon on the confluence of the rivers Lot & Garonne. Bath and separate shower. Separate WC. Air conditioning is available in all rooms if required at a cost of £50.00 or euro equivalent per week payable on arrival. lounge with 2 & 3 seater sofas. Flat screen TV, Sky freeview satellite, DVD, woodburning stove set in an inglenook fireplace, compact CD player & radio Dining room with table chairs & buffet bar. Gas hob, electric oven, fridge freezer, microwave, dishwasher. Excellent golf facilities within half an hour at Casteljaloux and Tombebeouf. The pool is for your private use apart from 1 hour between 5 and 6 pm when the owners have a private swim. Outside: Set in grounds of 10 acres with own private garden area set aside for guest's with BBQ, table, chairs and summer kitchen. Pool 10 x 5m with roman steps for easy access, sun loungers, parasols. Outside solar shower The pool is for your private use apart from 1 hour between 5 and 6 pm when the owners have a private swim. Utility Room: Washing machine. Iron and ironing board. Vacum cleaner. Broom, mop, bucket. Cleaning / Towels / Linen / Maid service: Towels and linen are included. The cottage is cleaned weekly on Saturday. Towels and linen are changed weekly on Saturday. Great stay in beautiful Gite. Beautiful Gite peace and tranquility in super setting. Everything was lovely, the Gite had everything you needed kind of home from home! Hosts Allan and Celia are great company, not forgetting Charlie the Spaniel. Weather was amazing and the pool was terrific. Situated perfectly for visiting lovely places, local restaurants were great. We really enjoyed our stay. This is the third time we have stayed with a great hosts Allan and Celia and we are already looking forward to next year. The house is wonderful and so are the gardens and the pool, highly recommended. Our third stay at Blanchou with our lovely hosts Allan and Celia as before a fabulous stay and the company as ever Tres Bon. Missing France already we would recommend Blanchou to our friends, and our overall view of this property is fantastic, good outdoor eating, pool and gardens the Gite has every facility and the air conditioning is a bonus. The night markets in the Bastide Twons are a must and your host will give you the advise you need to enjoy your stay. A corner of paradise . We found Blanchou cottage an excellent holiday accommodation. It was tastefully furnished, spacious and very well equipped with everything you could think of, including air conditioning in every room ,which afforded welcome relief from the very high temperatures we experienced whilst staying there. The addition of a Summer kitchen with fridge, sink, music centre and bbq. was a bonus in the evenings, sampling the delights of the local markets. The gardens were extensive and delightful, with various seating areas ideal for relaxing. Although we are in our mid -70's, the cottage is superb for families, with a huge private garden ideal for games using all manner of toys available, and of course the beautiful pool. The owners are a very friendly couple and certainly enhanced our stay there. Blanchou Cottage is a quality and stylish cottage in which to enjoy a wonderful holiday in France. The thoughtful and friendly owners Allan and Celia are experts at ensuring that everything you require is available for a relaxing and comfortable stay. Within 10 acres of grounds there are carefully planted beds, an array of containers overflowing with colourful flowers, new trees are thriving, huge old trees provide welcome shade and there is a swimming pool! Indoors there are soft settees to lounge on, comfortable beds with lovely linen to sleep in and an easy, well equipped kitchen and dining area from which to prepare and eat delicious meals using fresh produce of the region. If you want to wander from this special place then there is beautiful countryside all around, orchards everywhere, pretty villages to explore and a local railway service to Bordeaux gives an easy option to visit this great city. Two weeks not long enough, we shall return! We spent 2 wonderful weeks in the beautiful Blanchou Cottage. The property has lots of character, and contains everything you could possibly wish for. All rooms are comfortable, and there is plenty of room inside. The gardens are extensive, and amazing in full bloom. 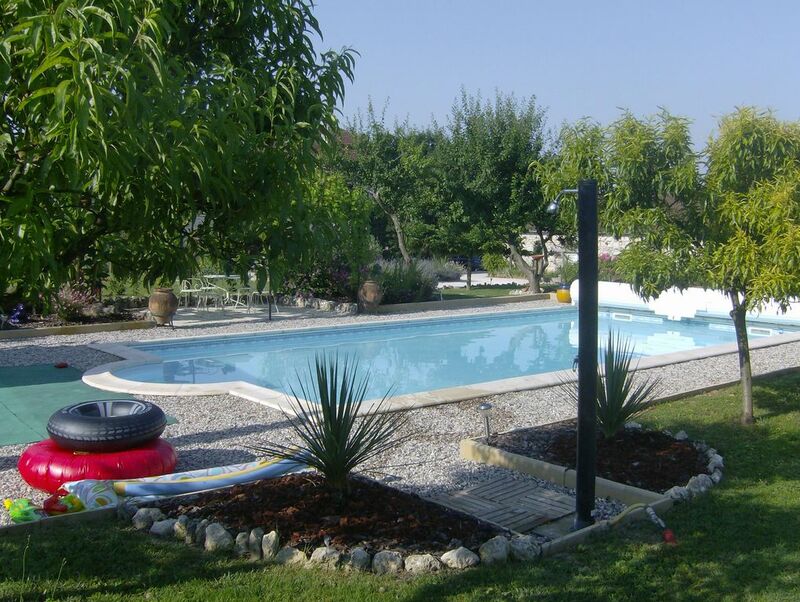 The swimming pool and decking area are fantastic, providing hours of fun, or time to relax. The Summer kitchen is a great space for relaxing at any time of the day, with a nice barbecue, fridge and plenty of seats, loungers, and even outdoor games. Allan and Celia were fantastic hosts - friendly, thoughtful, helpful and great surrogate grandparents! Charlie the dog was a welcome addition to our holiday, and provided an extra playmate for our girls. Although there are no amenities within walking distance, there is an abundance of shops, restaurants, river beaches etc a short drive away. The surrounding area is beautiful countryside, with plenty to explore. I would highly recommend Blanchou cottage for a family holiday. We would love to return one day, as we had an extremely memorable fortnight here, and did not want to leave! Bergerac and Bordeaux airports both 75 minutes away. Local car hire is available at both airports at very reasonable rates. Channel ports 10 hours. Rosscoff & St.Malo 7-8 hours. Car essential. Clairac 10 mins, restaurants, cafe's, shops, local weekly market. Aiguillon 10 mins restaurants, cafe's, shops, market twice weekly. Temple sur Lot with the famous Monet's gardens. Chateaux's of Duras, Bonaguil 1hr away. Only 20 minutes away is the canal lateral where Rick Stein meandered along on a barge in his French Odyssey programme with the Halt Nautique at Laguerre boasting a delightful restaurant along its bank. Horse riding 15 mins at Clairac. Canoeing at Castelmoron 20 mins. Walking & cycle routes nearby. Both Clairac and Aiguillon have good supermarkets and banks. Booking Notes: A 25% deposit is required at time of booking, balance to be paid 8 weeks before start of the rental. As is usual with a property of this quality a security deposit of £250 will be required, please see "Terms & Conditions" in our website.If you require Air Conditioning a charge of £50.00 per week or Euro equivalent to be paid on arrival. Changeover Day: Changeover day is Saturday arrival is from 16.00hrs and departure is by 10.00 Flexibility depends on bookings. Notes on prices: A 25% deposit is required to secure the booking, balance to be paid 8 weeks before start of rental. As is usual with a property of this quality a security deposit of £250 will be required. (please see our terms & conditions on our website).